I painted "Brume" and "Slur" in buon fresco, an ancient technique of pigmenting wet lime plaster. In its purest sense, buon fresco is a method of painting into stone. This practice of fusing pigment in plaster is compelling not only formally, as the crystalline surface is literally jewel-like, but also because the techniqueís stone-like permanence has historically been a key factor in its monumental use to adorn buildings and consolidate authority for patrons. Although my process is rooted in traditional methods such as fresco, my goal is to create contemporary images that reflect on metaphysical ideas such as flux, being/non-being, and permanence/non-permanence. Both "Brume" and "Slur" were painted using an airbrush (spray paint) and monochromatic palettes. 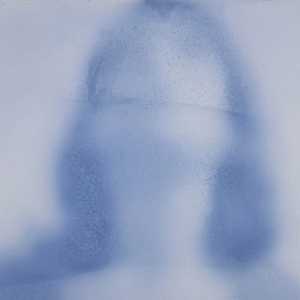 In each work fine mists of color were sprayed onto a white plaster surface until a veiled figure emerged. The atomized dispersal of the figures creates a shroud, a barrier between the viewer and the portrayal.